Young crops grow in the foreground, with two hut beyond, showing differing thatching styles. The hut to the right has a series of thatch layers and a long fringe to let water drip away from the walls. The film number suggests a Gaajok homestead in 1935. Note on print reverse ms pencil - "83" & print front border ms ink - "NUER XIV/50"
Morton, Chris. 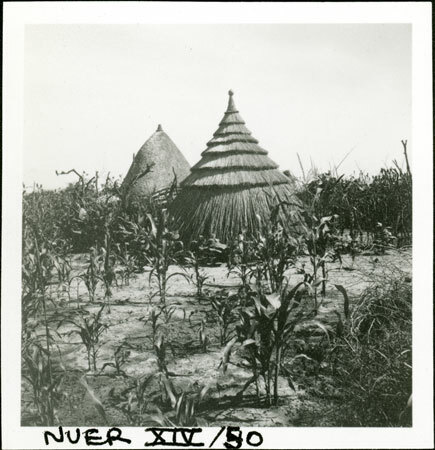 "Nuer huts and garden" Southern Sudan Project (in development). 03 Jan. 2006. Pitt Rivers Museum. <http://southernsudan.prm.ox.ac.uk/details/1998.355.675.2/>.